Just walk to the nearest beach on Phi Phi Don or take a longtail boat out to the stunning Phi Phi Ley and you will have a day out that deserves and ice cold cocktail or beer and give you a myriad of stories and memories for a long time to come. The above water is obviously spectacular with the huge cliffs soaring out of aqua blue waters but the marine life below is as dramatic as any National Geographic TV show and way more intimate. After a morning snorkeling with the sharks off Phi Phi Ley we were just in the mood for hanging out on the near perfect sand of Long Beach. On the quiet end of the beach, near the rocks, a small shack type pancake house had opened (since the last time I was here). Pancakes, tea and sifting sand through our feet for an hour or so, we were revitalized enough to don mask a fins for a snorkel. As we got in the water small groups of shallow beach fish surrounded us and followed us to the first corals. Wrasse, parrot fish, mullet and the occasional grouper seem to fill the seas where ever we looked. We spent over an hour pottering around the reef in no more than 5 meters of water before returning to the second session of pancakes. The simplicity of the moment is what made it for me. I'll be back..:). Shark watch starts here at sunrise. We arrived at high tide and the Nui Bay on the north west of Phi Phi Don seemed almost too perfect. Nui means little and the cute strip of white sand is framed by steep cliffs on both sides. 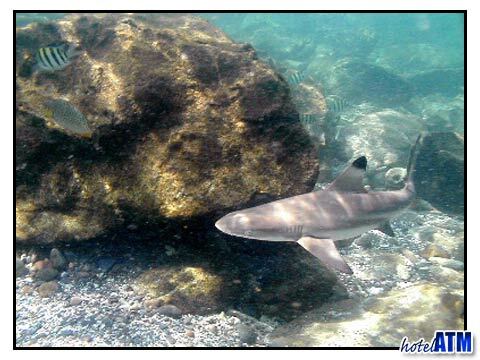 The reef is a 40 meter swim out towards Camel Rock and the sea is full of colorful juvenile species. Out at the deeper reefs off Camel rock (the west side drops to 22 meters you get a whole range of large reef fish and the occasional sighting of whale shark. Be careful of the caves to the right off the bay, cave snorkeling is a very un forgiving pastime if you get it wrong!!! The best snorkeling off this primordial beach is on the west nearest Phuket under the cliffs. Stunning. Maya Bay is where the shot the movie "The Beach" and it starred Leonardo Di Caprio in one of Hollywood's less favorably received films but realistically reflecting the backpackers love of adventure to a budget. The views are stunning but the reef is 80 meters off shore and most anchor their boats on the organized buoys. My favorite snorkeling is on the left hand walls as you arrive at the entrance of Maya Bay. 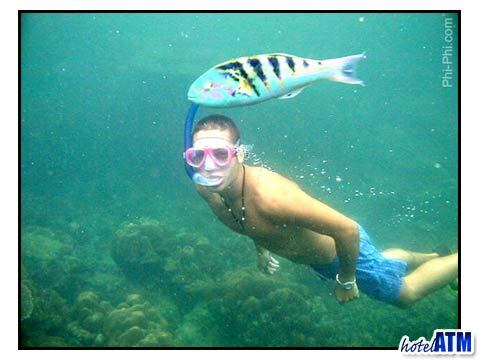 See here for other good snorkeling spots on Phi Phi ley .